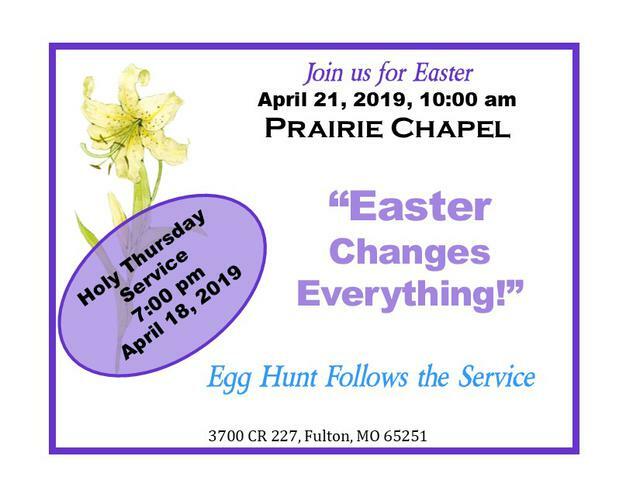 Prairie Chapel (Fulton, MO) is an open-country congregation that worships in a traditional style with a little bit of gospel thrown in. Join us for worship at 10:00 am each Sunday. Expect to see attire from ties to jeans and a little in between. Children are always welcome in worship or departing worship at 10:15 for Children's Sunday School in our fellowship hall. Adult Sunday School has returned each Sunday at 9:00 am. Thursday Night Small Group (1st and 3rd Thursday) 7:00 pm. continues. This Week, Thursday, 7:00 pm, Holy Thursday Service. Join us as we revisit the Passion of Christ in Scripture, song and prayer. Sunday, Easter! 10:00 am "Easter Changes Everything," Egg Hunt follows. Every Sunday, 9:00 am, Sunday School. We are now studying the letters of the New Testament in chronological order and relating to Acts and other events in the lives of the Apostles. Every Fourth Sunday, a Fellowship Meal following Worship.